With the mixture of a stable political and economic environment; rich in natural resources; high living standard; excellent geographic location, situated at the key position of Asia Pacific; and a favorable time zone to Mainland China and Hong Kong, Australia is definitely the best choice for business, investment and migration! WHIM us now managing below projects in Australia! In view of the saturated and limited investment path in PRC and Hong Kong property markets, WHIM always seeks for high return overseas investment projects. The most popular project is the site redevelopment in Australia! Suitable for investors with high level of investment. Brand new model for property investment. High return of at least 40%. Detail analysis to master the expected return. Provision of professional one-stop services, included sourcing of the best site according to the investment budget; managing property development with developer partners; and collaborating with property sales agents and various local banks in Australia, to facilitate the fund raising and property sale processes. A team mix of Architects, Accountants and Project Managers, together with over 10-year experience of managing over 100 projects, WHIM is expert in cost control to maximize investor’s return. The Australia real estate market maintains a continuous upward trend throughout the past fifteen years, which is a perfect market for property speculation! Suitable for flexible investment plans. Sort out high-potential properties ready in the market. Detail analysis in terms of rental return and district transactions. Provision of advisory services on tax and documentary issues. According to the official statistics, the supply of hotel rooms in Queensland (Gold Coast and Brisbane) has been unable to meet the continuously growing demand in recent years. As Gold Coast would be the host city of Commonwealth Games 2018, the city is actively raising funds for numerous infrastructure projects, including redevelopment of hotels and other relevant tourism facilities in the “Surfers Paradise” district. Suitable for high level of investment. Favorable for investors with experience on hotel and resort development and infrastructure projects. Enjoy long term investment return. Australia enjoys plenty of natural resources, with high-quality agricultural, dairy, winery, wool, fishery industries and other processed products share a major part in the global market. The Australian Government has been promoting non-mining business development for those sectors in recent years. Accordingly, some Chinese investors have already invested in local farms, factories and wool production lines as long term investment. Expand the business to the global market. 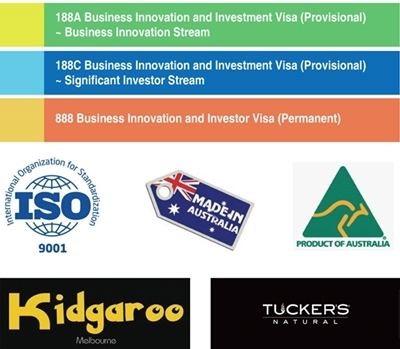 Manufacture “Made in Australia” products to develop an Australian brand for image upgrading. Design and establish roadmaps for business set up, factory building and production line alignment. License registration and provision of marketing strategies. The extensive purchasing power from the local Asian group has driven up the Australia’s retail market over the past 10 years. Numbers of chain restaurants and retail stores are set up there. In current year, WHIM brought a Hong Kong based retail business, MyBB Store, to Australia. WHIM also provides one-stop overseas company establishment if investor possess any professional qualifications and management skill in different aspects. Suitable for small to medium sized investors. Excellent for investors intended to stay in Australia for a certain period. Provision of one-stop services, including company incorporation, procurement, business flow design, staff training, shop design and renovation, sales and marketing and commercial regulations compliance. Being blessed with mild climate, favorable time zone with Asia, rich natural resources, beautiful landscapes, Australia’s major cities have been top-ranked in the Global Livability Survey for years. Hence, investors would always consider applying Business Migration when diversifying their investments in Australia! Partnership with experienced Immigration Consultants. Flexible investment plan according to the immigration needs. Provision of latest immigration information. 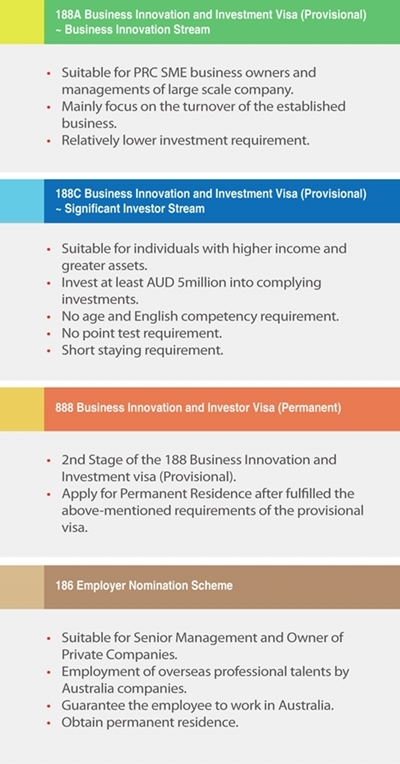 Feasibility analysis on each investment plan for immigration. Immigration to Australia and Hong Kong S.A.R.